You can create your own customized editable version of this contract document using Contractors Contract Pack. Follow these steps to get started. 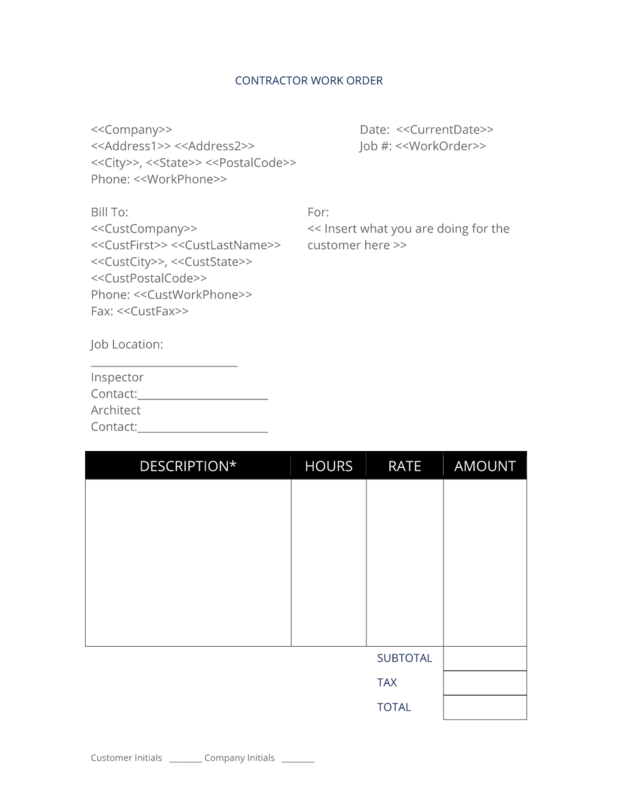 Use the General Contractor Work Order form for general contracting services. Includes a page of general contract and terms clauses including payments, performance of services, delivery of services, limited warranty and damages. 1. Get Contractors Contract Pack that includes this business contract document. This General Contractor Work Order is included in editable Word format that can be customized in Word or by using the included Wizard software. Once you have ordered and downloaded your Contractors Contract Pack you will have all the content you need to get started with your own formal declaration. Insert what you are doing for the customer here. This quote may be withdrawn within Days days if not accepted by Customer. Any changes to the specifications or costs will be accepted only by submitting an approved contract change addendum agreed to and signed by both parties. Customer agrees to engage Company to perform the Services as described above. Company will use reasonable diligence in the performance of the services and will endeavor to deliver to Customer no later than Delivery Date. Customer acknowledges, however, that this delivery deadline is an estimate and not a required delivery date. For all of Company's services under this Agreement, Customer shall compensate the Company, in cash, the amount specified in the total above. In the event Customer fails to make any of the payments referenced by the deadline set forth as invoiced, Company has the right, but is not obligated, to pursue any or all of the following remedies: (1) terminate the Agreement, (2) remove unpaid materials from the job location, (3) bring legal action. Company warrants the services will conform to the Description above. If the services do not conform to the Description, the Company shall be responsible to correct the non-compliance without unreasonable delay, at the Company's sole expense and without charge to Customer, to bring the services into conformance with the Description. This warranty shall be the exclusive warranty available to the Customer. Customer waives any other warranty, express or implied. Customer waives any claim for damages, direct or indirect, and agrees that its sole and exclusive remedy for damages (either in contract or tort) is the return of the consideration paid to the Company. This Agreement shall be binding upon and inure to the benefit of Customer and the Company and their respective successors and assigns, provided that the Company may not assign any of its obligations under this Agreement without prior written consent of Customer. The above prices, specifications and conditions are hereby accepted. The Company is authorized to execute the project as outlined in this Agreement. Payment will be made as proposed above. The complete General Contractor Work Order - with the actual formatting and layout - is available in this Contract Pack.